Built 2011 complied march 2015 4x4 7 seater 2. 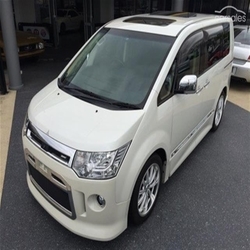 4 litre 6 speed sports automatic (with paddle shift) new shape current series roadest roar complete package model mitsubishi delica d5 luxury sports people mover in metallic pearl white with black sports cloth interior, full factory sports body kit with chrome trim package and 18 weds maverick alloy wheels, aftermarket tein coilovers, hid projector headlights with fog lamps, triple sunroofs, electric sliding side doors, 360 degree vision cameras system, ducted rear air conditioning, tinted windows, weather sheilds, amazing factory rockford fosgate sound system, full electrics, full safety features, travelled a genuine 27,9998 kms, fully complied and complete roadworthy performed in our quality assured workshop, 12 months qld warranty and simply and drives amazing and priced to sell! Others to choose from and we are specialists in providing interstate transport australia wide!